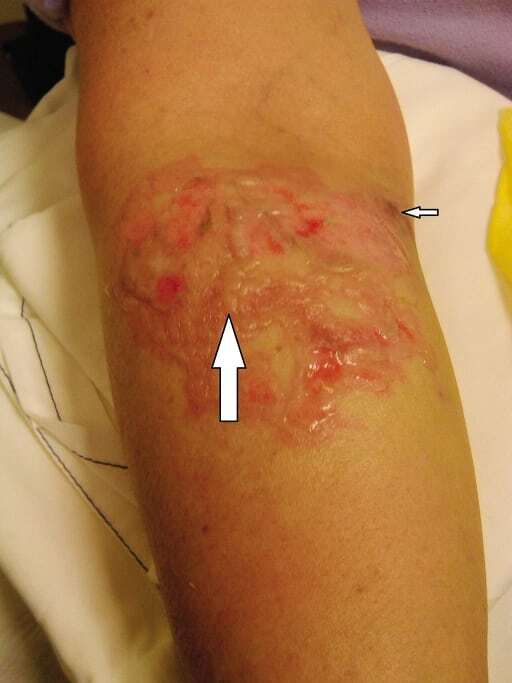 This report reviews a case of dermatomyositis presenting with weakness and extensive calcification in an adult. While dermatomyositis is not uncommon in adults, it is uncommon for calcifications to be present. 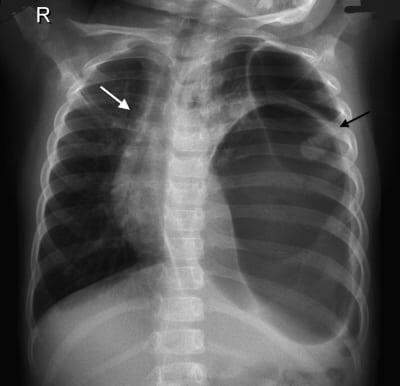 Children develop calcifications more frequently than adults. When present in adults, small calcifications on areas of frequent trauma such as elbows and fingers are more common. 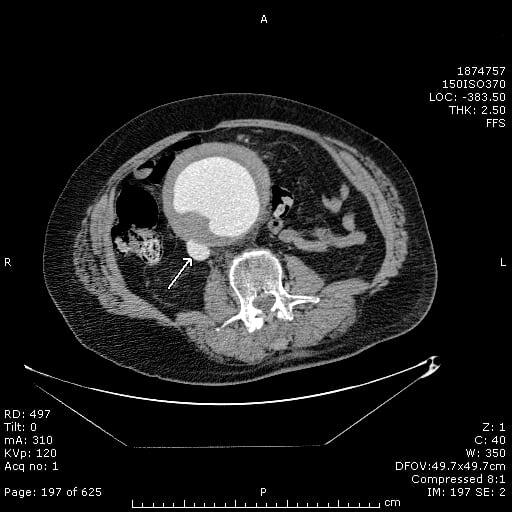 However, this patient presented with large calcified deposits in his abdomen and extremities. His treatment and course are described. 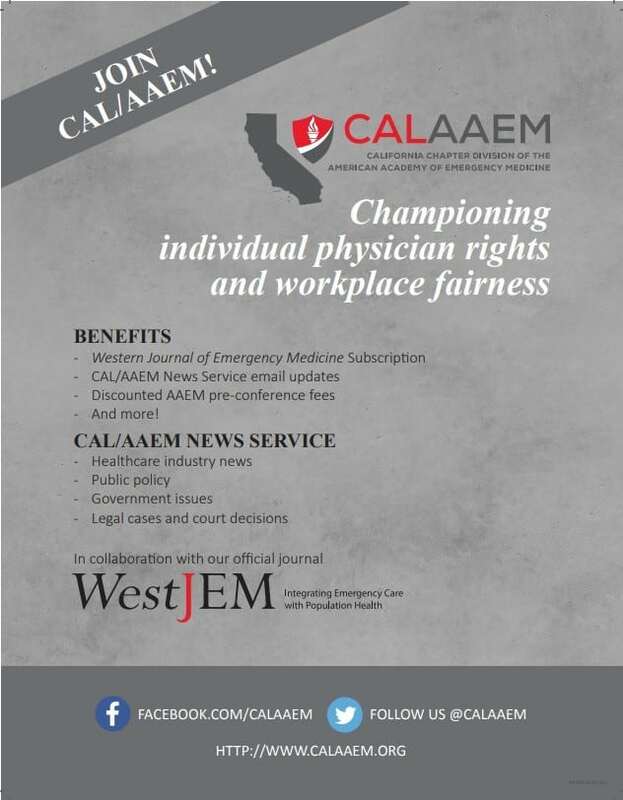 To alert emergency medicine practitioners that H influenzae should be recognized as a maternal, fetal, and neonatal pathogen. Clinicians should consider this diagnosis in immigrants presenting with uncertain vaccination history, as H influenzae can cause significant morbidity and mortality. 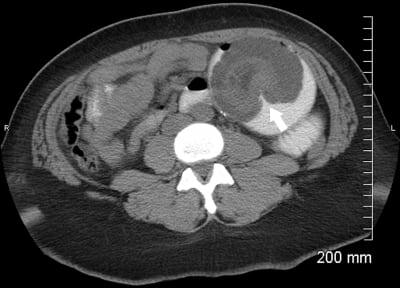 A 34-year-old male presented to the emergency department with a 3-hour complaint of pain in the right lower quadrant and right testicle. He stated that his pain began suddenly while standing at work. On physical examination, he had a small, firm, unreducible bulge in his right inguinal canal and an enlarged right scrotum. The patient was placed in trendelenburg position; intravenous fentanyl, valium, and dilaudid were administered; and surgery consult was obtained. 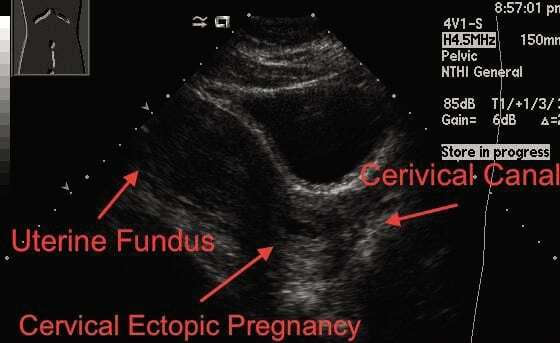 A testicular ultrasonogram (Figure) was obtained owing to continued pain in the right scrotum and inability to evaluate the testicle. After viewing the ultrasound pattern, the patient was promptly taken to the operating room 6 hours after onset of symptoms. Urinary tract interventions can lead to multiple complications in the renal collecting system, including retained foreign bodies from endourologic or percutaneous procedures, such as stents, nephrostomy tubes, and others. 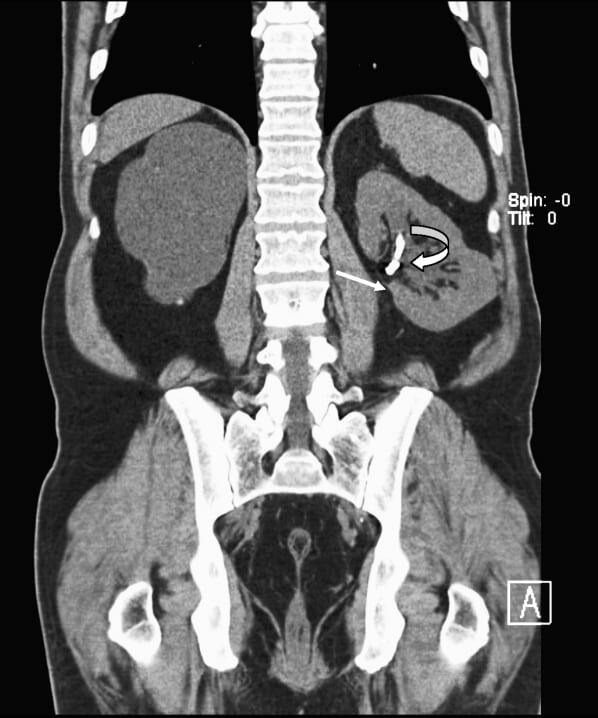 We report a case of very delayed erosion of embolization coils migrating into the renal pelvis, acting as a nidus for stone formation, causing mild obstruction and finally leading to gross hematuria roughly 18 years post transarterial embolization. History is significant for a remote unsuccessful endopyelotomy attempt that required an urgent embolization. A 31-year-old, who is gravida 2 para 1 at 6 weeks by last menstrual period, presents for vaginal bleeding starting approximately 5 days earlier. The bleeding was initially light, and there was no associated abdominal pain. The bleeding seemed to stop when she laid down and increased upon standing. 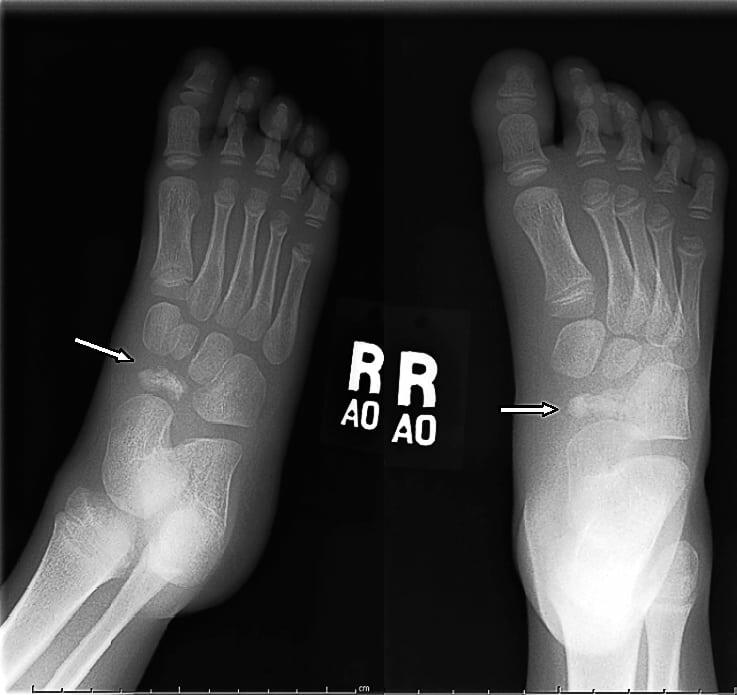 We present a pediatric case report of foot pain due to Kohler’s disease. A 4-year-old girl was brought to our hospital by her parents because of abdominal pain. She had suffered minor trauma after rolling from her standard-height bed 2 days prior. Vital signs were appropriate for age. Physical examination was remarkable for decreased breath sounds to the left side of the chest. 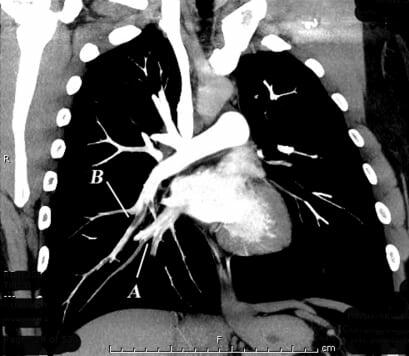 A chest radiograph (Figure) demonstrated a large gas-filled structure in the left side of the chest with mediastinal shift. Acute prevertebral calcific tendonitis (APCT) is a rare condition, the exact incidence of which is unknown. 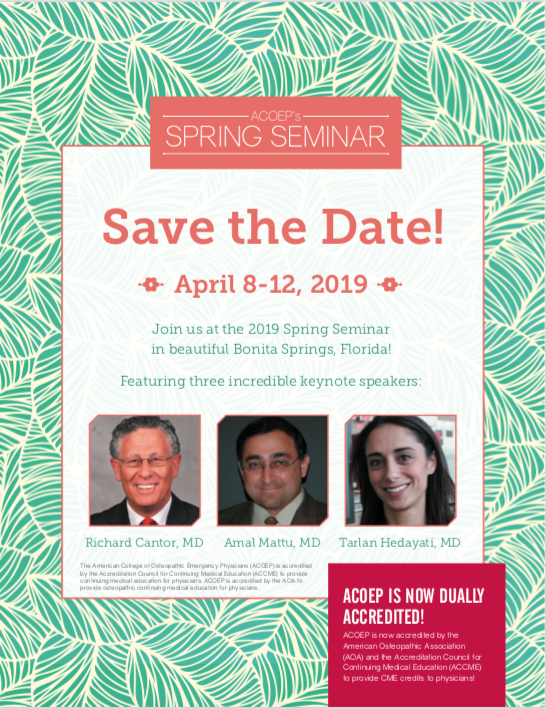 It is of particular interest to the emergency physician owing to the other potentially devastating conditions in the differential diagnosis of neck stiffness and/or odynophagia (including retropharyngeal abscess, infectious spondylitis, and meningitis.) In contrast, APCT has a benign clinical course and can be easily managed in the emergency department. 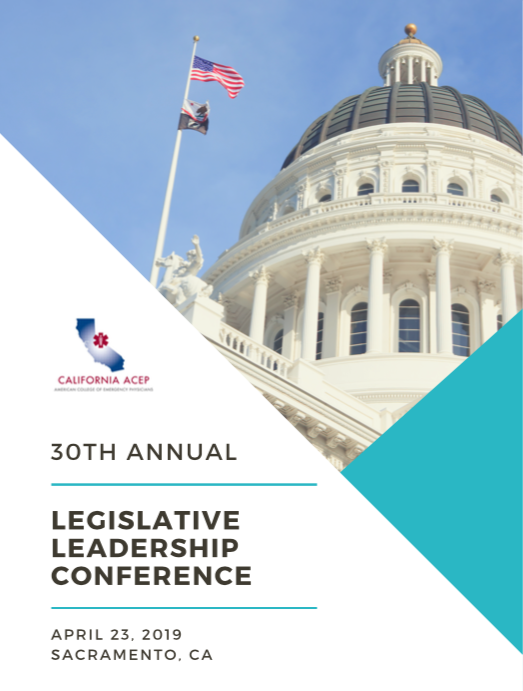 We will present a case of APCT, followed by a brief discussion of the disease and current literature. 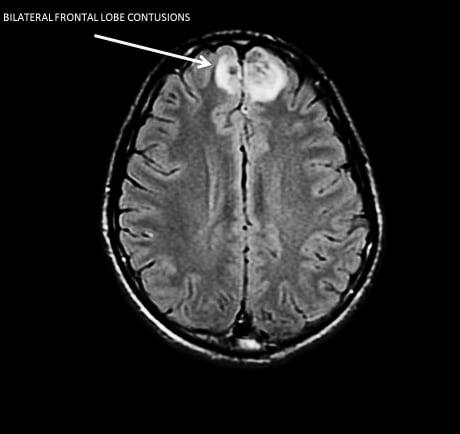 We describe a 65-year-old man who presented to the emergency department with acute cerebral air embolism after receiving computed tomography guided lung biopsy. 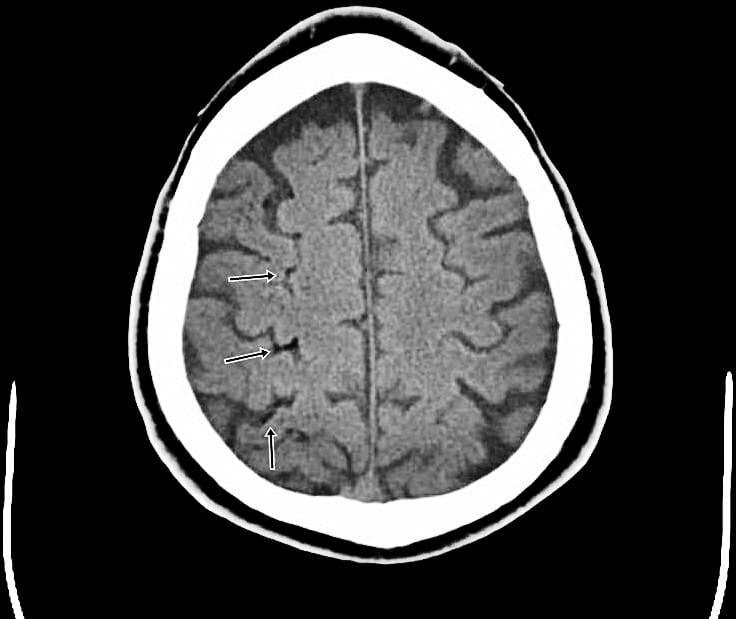 Subdural hematoma (SDH) is a rare, but life-threatening complication of spinal anesthesia. Subdural hematoma resulting from this procedure could present with vague symptoms such as chronic headache and could easily be missed. 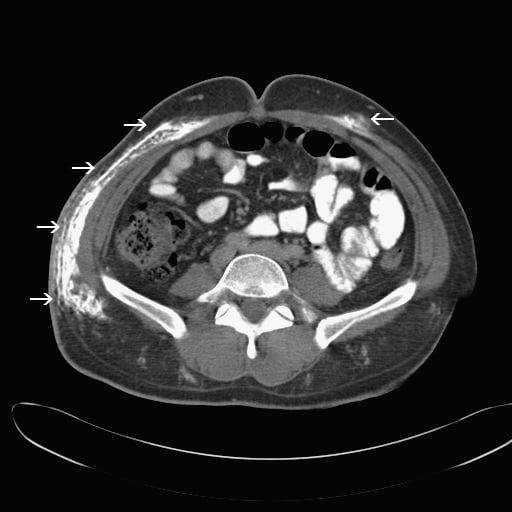 A 68-year-old male with moderate mental retardation presented to the emergency department with anorexia, constipation, and abdominal distension for 4 days. Medical history was significant for partial colon resection for presumed bowel obstruction 3 years previously (no true anatomic cause for obstruction was identified at surgery). Diverticulosis is a common disorder among geriatric patients, of whom 10% to 25% go on to develop diverticulitis. Known complications of diverticulitis include formation of phlegmon, fistula, bowel obstruction, bleeding, perforation, and colonic abscess. 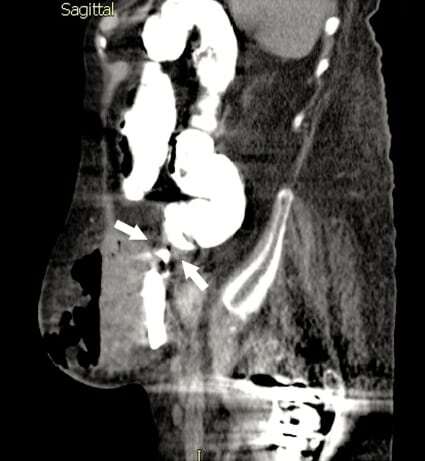 A less common complication is perforation with formation of an extra-abdominal necrotizing abscess. 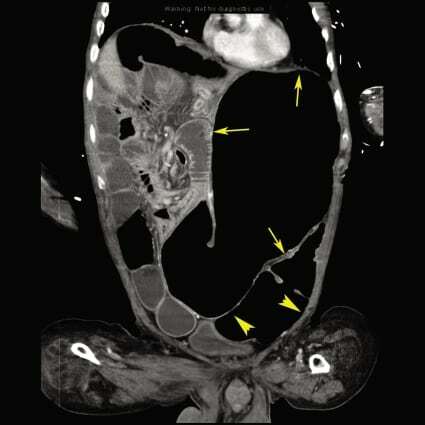 This case is a report of an 83-year-old female who presented to the emergency department with a necrotizing abdominal wall abscess secondary to right-sided diverticular microperforation. Volvulus is an unusual condition in Western countries, generally isolated to elderly patients with multiple comorbidities. 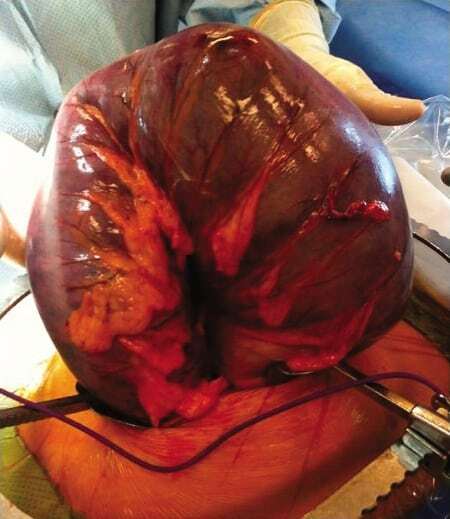 This report describes an unusual case of a very large gangrenous sigmoid volvulus in a young, otherwise healthy 25-year-old female. 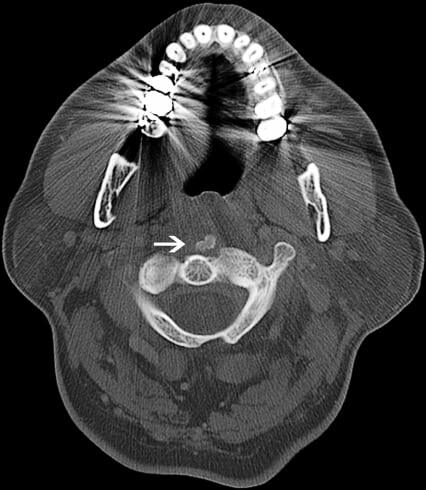 A review of the diagnosis and management is subsequently described. Without a consideration of the atypical demographics for sigmoid volvulus, the case illustrates the potential morbidity due to a delayed diagnosis. Early identification and management are crucial in treating sigmoid volvulus before the appearance of gangrene and necrosis, thereby avoiding further complications and associated mortality. A 25-year-old male presented to the emergency department with 1 week of progressive right-sided chest pain. The pain was sharp, radiated to the back, and worse with deep inspiration. He denied dyspnea and leg pain or swelling. 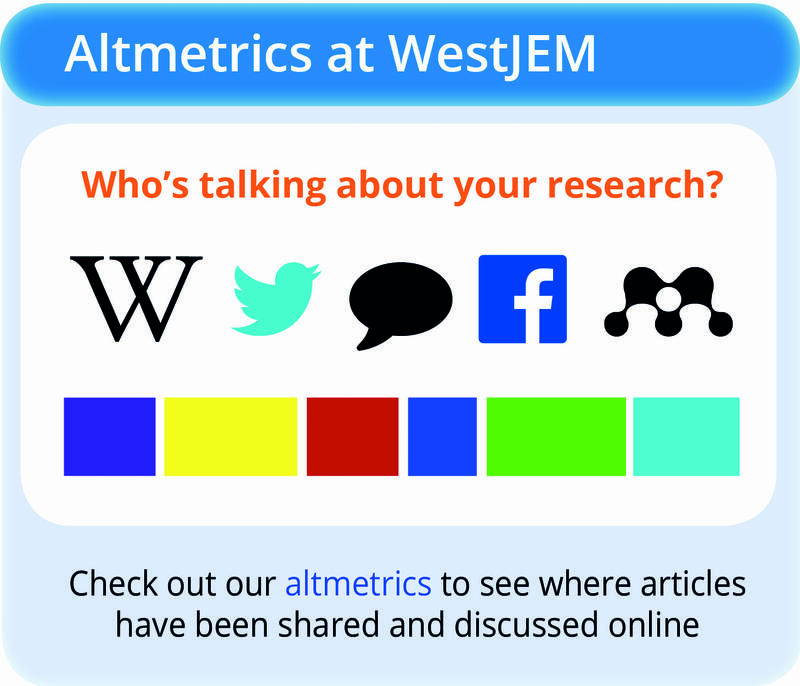 A 38-year-old female presented with acute onset epigastric abdominal pain and vomiting. Surgical history included gastric bypass surgery 8 years prior and cesarean delivery. The patient was in severe distress, afebrile, had significant epigastric tenderness with guarding, normal bowel sounds, and no distention or masses. A 62-year-old female presented to the emergency department (ED) with right lower quadrant pain for 3 days. 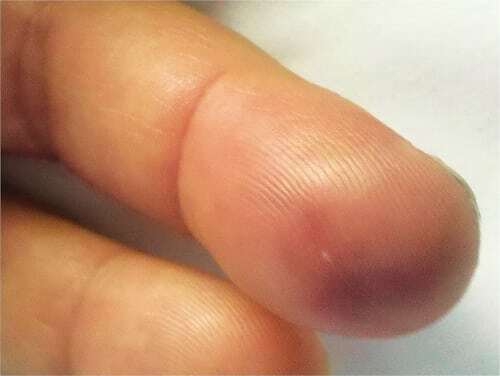 A 52-year-old Caucasian male presented to the emergency department complaining of nontraumatic painful swelling and redness of the distal left fourth finger for 2 days, associated with malaise and subjective fever. The patient denied medical history, drugs, tobacco, or alcohol use. A 77-year-old Caucasian male with a history of hypertension presented with sudden onset of lower back pain, nausea, and vomiting. A 34-year-old male presented after ingesting 150 mg of atropine. He had altered mental status, sinus tachycardia, dry mucosa, flushed skin, and hyperthermia. Sequential doses of physostigmine, totaling 14 mg, were successful in reversing antimuscarinic toxicity and prevented the need to perform airway control with endotracheal intubation. At completion of treatment, heart rate and mental status had improved, and intubation was never performed. Can we define a group of pit viper victims who are at low risk for hematologic venom effects (fibrinogen degradation and/or platelet destruction) and spare these patients the time and expense of serial laboratory testing? 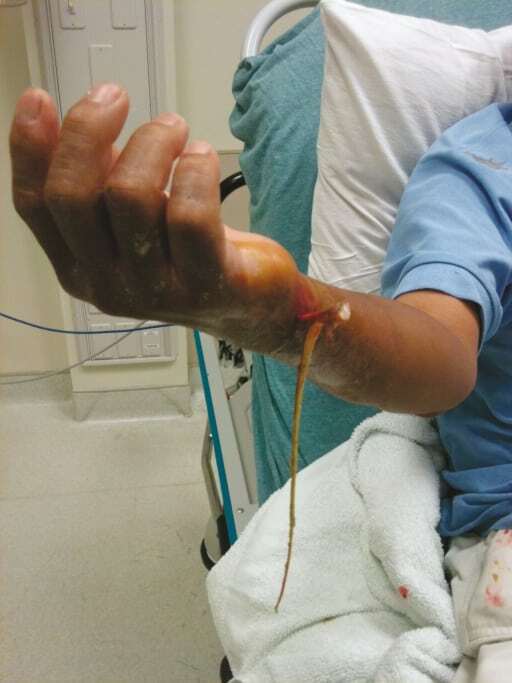 In this study, we sought to determine whether it was possible to limit the practice of ordering coagulation studies to those patients suffering severe envenomation, rattlesnake envenomation, or both. The objective was to demonstrate the effect of a range of SBE-CD concentrations in a rat model of verapamil toxicity.